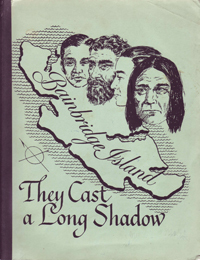 Brian Roberts is the editor of They Cast A Long Shadow: A History of the Nonwhite Races on Bainbridge Island (1975), a publication of the Minority History Committee of the Bainbridge Island School District. Written as a curriculum aid for students, this collection of stories about Japanese, Chinese, Hawaiians, Filipinos, Vietnamese, Native Americans, and Native Canadians is an attempt to explain "what life is like for people who look different." The stories all relate the history of each of the ethnic groups on Bainbridge Island from the time of their arrival through the 1970s. Accounts of individual experiences from each group, together with black and white photographs, are used to illustrate the stories.